Barbecuing spare ribs that are tender, juicy and succulent is a time-consuming but very simple and rewarding process. Ribs need to be cooked a long time over a slow, indirect heat. I cook on either my Traeger or Memphis pellet grills, generally with 100% Hickory pellets. The keys to success: 1) Trim spareribs to "St. Louis cut" or use baby back ribs, 2) use a dry rub, 3) Cook low (225F) and slow (4-5hrs), and 4) be Patient! If cooking spare ribs, trim them before cooking. 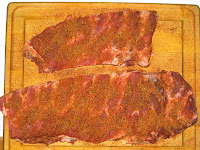 See the "Trimming Ribs" article to trim spareribs to a St. Louis cut. This step is important for the ribs to cook evenly and look delicious. If cooking baby back ribs, just trim any excess fat off the ribs. Although spare ribs are generally meatier, I've found that the baby back ribs at Costco have been great, and not expensive. They cook to perfection -- meaty, tasty and juicy. Leave the ribs out of the refrigerator for up to two hours before cooking. You want them at room temperature. Rub the ribs with Merlin's Magic Rub (see separate recipe) or your favorite rub just before cooking. Spread a thin layer of yellow mustard on the ribs before applying the rub to act as a "glue". The mustard won't affect the taste but will hold the rub in place. Don't skimp on the rub! You've applied enough when you can barely see the meat. Ribs should be cooked at a low heat, around 225F. With a pellet grill that has a built in thermostat, just set the thermostat at 225F, put the ribs on the grill and close the cover. Make sure the hopper is filled with pellets. Baby back ribs take about 4 - 4 1/2 hours and spare ribs about 5 hours. You can wrap the ribs in foil after two hours of cooking. I've found that this keeps the ribs juicier. At the two hour mark wrap each slab separately and put back on the smoker. At the three hour mark unwrap and continue cooking in the smoker until done. You need that last hour or more without foil so that the ribs get their bark back. Ribs are done when they are done. Seriously, they are done sometime between four and five hours. A good, reliable, infallible test is the "bend test". Pick up a slab with a pair of tongs. If the ribs are ready, the slab will bow and the meat will slightly crack on the surface. They are done. Take them off the smoker at that point! I generally don't sauce the ribs on the grill. I'll serve them "dry" and let everyone choose their own sauce at the table. But if you do sauce the ribs on the grill, wait until the ribs are done. Increase the heat to 350F. Brush the ribs with warm sauce and grill for 5 minutes. Make sure the ribs don't burn! If you sauce earlier, the sugar in the sauce will burn while cooking, which is not a pretty sight. You can cook the ribs a couple hours before eating and then reheat a couple of different ways. First, just before eating, put the ribs on a hot grill to warm them. Or, an hour before eating put them in a 200F oven, and cover with foil. Either way makes preparation easier and you still serve piping hot, tasty, succulent ribs. To serve, cut the ribs cleanly with a good, sharp knife. Serve hot and with sauce. Grab some napkins and get down to delicious eating! Great ribs, Great company and Great fun!